In 1989 a group of 250 people reached Punta Heilbronner and after a hike in the fog joined another group of 50 French members coming from the Aiguille du Midi in the vast plain at the foot of The Tacul Pyramid where they designed with their bodies the words: “Pour le Parc”. In 1991 14.000 postcards were printed and distributed all over the world by MW Italia exhibiting the words: “A Mountain of postcards for Mount Blanc”. 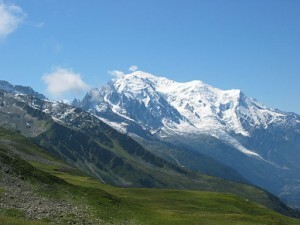 In 1996 a successful trek around the Mount Blanc range was organized. In 1999 another initiative took place: the relay “Three hundred thousand steps for the mountains” from Turin to Mount Blanc top. Another important initiative was the meeting on the summit of Mount Dolent on the Italian-French-Swiss border of MW members from the three nations. After protesting for many years against the repeater situated on the Aiguille de Trelatete, in 2002 MW Italia was at last rewarded with the decision taken by the Government of Valle d’Aosta Region to dismantle that obsolete installation. A few years later we went back there with two initiatives that were welcomed by the local people. One of them was a trekking along a symbolic itinerary connecting the Gran Paradiso National park, the first national park in Italy, to Mont Blanc, wich is still lacking an effective protection status. This was a success, although, for various reasons, only 16 people took part in it and 5 of them reached the Gran Paradiso summit. The weather has been favourable and allowed the trekkers to enjoy the beauty of blue skies, of white glaciers, of green valleys. Only for one day the trekkers had to stay in a mountain hut because of bad meteorological condition . The following day they climbed to the Ruitor Glacier from the South, along glacial slopes and rocks covered with snow,enjoying an unexpected rewarding alpine experience. In the same days, the Vice president of Mountain Wilderness Italy, Maria Cristina Garofalo and Renato Napoli, representative member of MWI together with some other members of MW Italia, carried out another important action: starting a campaign with the objective to register the Mont Blanc in the UNESCO World Heritage List. The idea is that would provide a status safeguarding not only the massif but also the strong original identity of its valleys and its inhabitants. For this purpose a booth was set up in various townships of the Valdigne: Aosta, Morgex, Pre Saint Didier, La Salle, La Thuile, Courmayeur where local people, tourists, holidaymakers could get the necessary information, talking to us, or reading the various flyers and articles on our magazines. A crew of the Valle d’Aosta TV was invited and made interviews to the organizers. We talked to the representatives of the regional Council, to the mayors of the towns who showed interest in our requests. After more than 25 years of activism in the Mont-Blanc our journey is far from over, we continue to work with leaders and members of MW Italia, France and Switzerland (including sometimes the members of Piemonte while we would like to see more engaged the folks leaving in the Valle d’Aosta. We strongly believe that a well preserved natural environment is the key for a long term balanced development, including tourism. Various hurdles and procedures will have to be overcome before an internationally recognized status providing the protection that the range deserves is achieved.